The First-Person Shooter (FPS) is arguably the most well-known genre of video games, yet all too often the gameplay strictly focuses on spraying an ever-replenishable amount of bullets into enemies with some tacked on, half-assed narrative to rationalize the mass murder. Often, I find the FPS experience increasingly mind-numbing and unsatisfying, a recycled, inane one-man-army affair. It wasn’t until I played Team Psykskallar’s Cry of Fear that I began to appreciate how games can benefit from ludonarrative resonance and an original story. Known for their award-winning mod Afraid of Monsters, Team Psykskallar’s latest efforts push the dated GoldSource engine to its limits in this spiritual successor, and are a testament to dedication and love for crafting games. It’s far from perfect, but easily one of the most refreshing and unsettling games I’ve ever played. Navigating darkness on an engine from 1998 never looked so good. 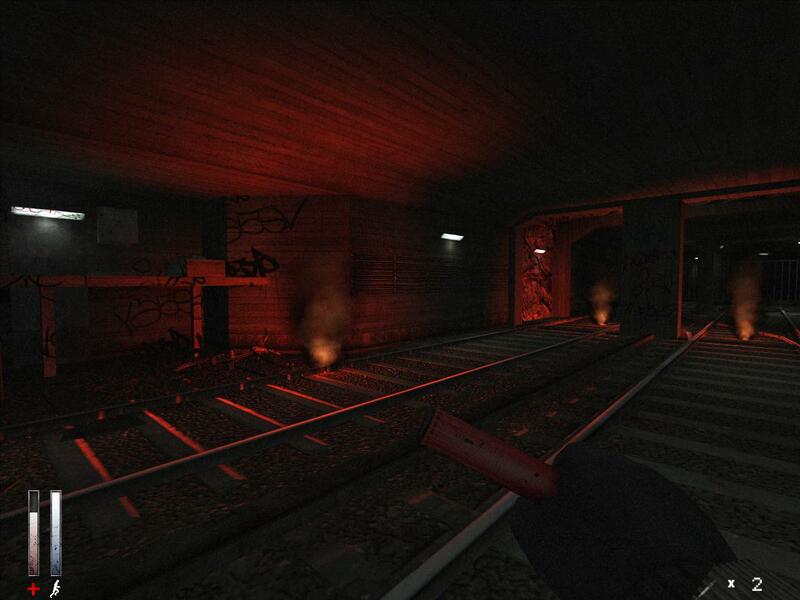 Initially created as a total-conversion mod for Half-Life,Cry of Fear was released in April 2013 as a standalone game after more than five years in development. The player assumes the role of Simon Henriksson, a seemingly innocent nineteen-year-old who, walking home one night, attempts to help a man crawling on the sidewalk and calling for help. It is in this spontaneous act of kindness where Simon’s life is forever changed as he is pinned up against a wall, a car driven by an unknown driver deliberately crushes his legs. What occurs next in the first-person perspective is even more mysterious- various flashes from Simon’s memories: a surgeon hovering over him, the stereotypical padded walls of an insane asylum cell, Simon smashing a surgeon’s head against the ground, splattered blood-written messages “Wake Up,” then “Take the Camera.” Suddenly we “awake” in Simon’s room and assume control of our young protagonist, equipped with said camera and an open door into a beckoning pitch black void. After a few cryptic messages, Simon, unknowing how he arrived, reawakens in downtown fictional Faversholm, Sweden with his original intention of returning home safely. From here the rest of the story unfolds, featuring Simon survive against improbable monsters while using a variety of weapons and scavenging for resources. Various flashbacks are presented throughout the game, teasing the truth of his circumstances, yet it’s never fully realized until the epilogue—Simon had become paralyzed from the waist down in the initial hit-and-run incident, forever bound to a wheelchair. After becoming increasingly spiteful and suicidal, he starts suffering from self-hatred, despair, and eventually hallucination-filled psychotic episodes. At the suggestion of his psychiatrist Doctor Purnell, he engages in a form of cognitive therapy to deal with the depression—writing about his emotions in a book. This technique eventually backfires with disastrous consequences as Simon ironically visualizes, details, and literally brings to life the inner demons that torment him. Thus, the game is a journey though Simon’s book and disturbed psyche, where we metaphorically face off against his inner demons, participating in the cognitive therapy. Although there are multiple conclusions, the most tragic feature Simon committing suicide after killing his psychiatrist, his friend Sophie, and his own mother. Gameplay is a mix of tense shooting that demands precision (ammo is quite limited), puzzle solving, and platforming through Simon’s nightmares. A few short cutscenes are scattered throughout the game as well, yet they never overstay their welcome and maintain the pace of the action. Even on the GoldSource engine, the graphics are perfect for setting the solemn tone in the game, especially with the grainy haze that clouds Simon’s vision- Is this just a strange memory or hallucination… a nightmare? As soon as you awaken alone in downtown Faversholm, you’re instructed on the basics of gameplay: inventory, movement, and attacking. The inventory system in Cry of Fear is simple and satisfying, and any FPS that includes one immediately deserves more respect than those without; shooting virtual guns gets stagnant and monotonous and I eventually desire some other kind of interaction with the world. The inventory itself is practical with an intuitive interface making equipping, combining, dropping, or dual wielding items accessible. Various notes and passwords are also stored in the notebook archive. 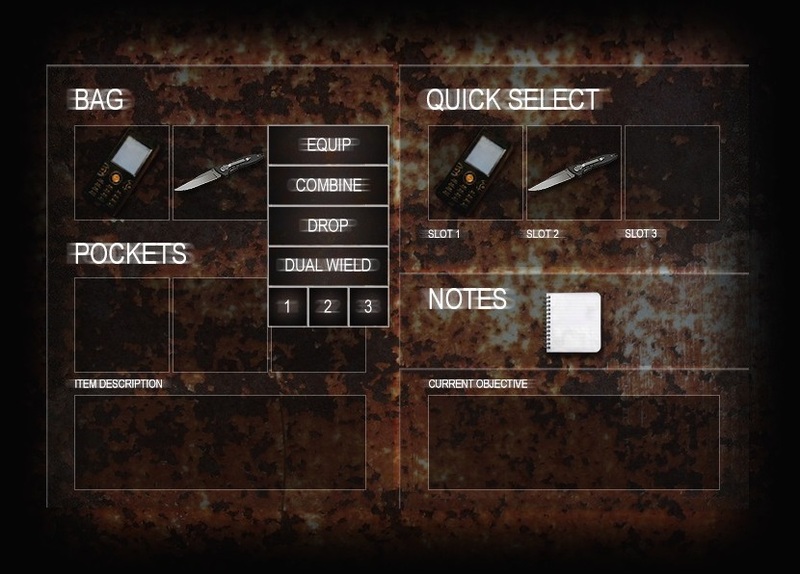 A total of six spaces are allotted for items- three in your pockets and three in your backpack, which is a perfect balance for the majority of the game. There have been some complaints about the limited space, yet it’s an oft-used trope of survival-horror games, and Team Psykskallar pulls it off well. I’d rather have the closer-to-reality limited carrying capacity of a nineteen-year-old with a side pack than the meager two weapon system of CoDs or Halos, or the walking-tank systems like F.E.A.R. or Half-Life. Having to drop some items to carry others adds to the tension as you are forced to make difficult decisions that will affect your experience in the future- Do I carry this new weapon or keep my flashlight? Movement is relatively standard and uninteresting at first glance: Simon walks around by default, but can sprint and dodge to escape dangerous situations, both of which drain his limited stamina. When fatigued, Simon will pant from the loss of breath, taking a few seconds to regain it while moving at walking pace. The regeneration process accelerates if he “sits down” to rest accomplished by crouching, adding a touch of realism. Sprinting and dodging isn’t just useful, but vital to surviving the horrors you face if you want to progress without losing too much health; I found myself constantly dodging and sprinting in short bursts to avoid attacks. Although helpful, Simon’s ability to move quickly is a complete delusion, representing his deep seeded desire to regain his ability to move freely on his own two legs, to escape and run away from his problems. The sad truth is again briefly realized when the player tries to sprint up or down a set of stairs: Simon stops abruptly as if he has ran into a wall. In effect he has, for subconsciously he knows he is stuck in a wheelchair without the use of his legs, no longer able to ascend/descend staircases. Even the field of vision is restricted with Simon wearing his hood the entirety of the game, clinging to any comfort and consolation he can muster- a child afraid of monsters, hiding under the covers. In order to console Simon’s psyche he must kill his nightmares violently using a variety of melee weapons and firearms. Dual wielding a flashlight and glock is a helpful hindrance- while this lights up the environment and reduces the anxiety of being alone in the dark, it also reduces accuracy with single-handed guns. Eventually, Simon is armed with an increasingly powerful arsenal. My impulse was to quickly unload clips into the horrors, yet this inevitably worked against me as I depleted precious ammunition. Another realistic detail is losing rounds that are left in the clip when reloading. I had to retrain from constantly switching out mags after engagements to save those last few bullets. The stress felt scavenging and expending resources as a player mirrored the apprehension Simon felt traversing his nightmare. Having low health causes Simon to cry in pain while slowly limping, the screen tilting with each step. To solve this, he equips a syringe to replenish the health bar. However, the “healthkits” in the game aren’t sterile syringes filled with instant magic healing juice- they’re exposed morphine syringes scattered on the ground throughout the levels, perhaps leftovers from a careless junkie. In effect, Simon never actually heals himself, and instead injects massive amounts of the opiate, numbing himself from past traumas. During this animation sequence we get a glance at Simon’s slashed, raw wrists. Although they’re not long, parallel cuts which signify a suicide attempt, they are obvious indications that Simon is mentally unstable and inflicts self-harm to cope with his depression. The enemies Simon faces in the game are disturbing, sometimes generic, sometimes twisted monsters that all seek to kill him. The macabre models aren’t necessarily frightening on their own- it’s their movement which forces me to play this game wrapped in Depends®. Most enemies tend to flail quickly with an inhuman twitch, even the ones that limp or crawl on the ground move abnormally fast. This isn’t just creepy as hell, but makes it more difficult to land critical headshots, as if the monsters are mocking Simon’s physical handicap, quickly circling their prey. Some have commented briefly on how Cry of Fear “relies” on jump-scares, and therefore is a weak horror game. 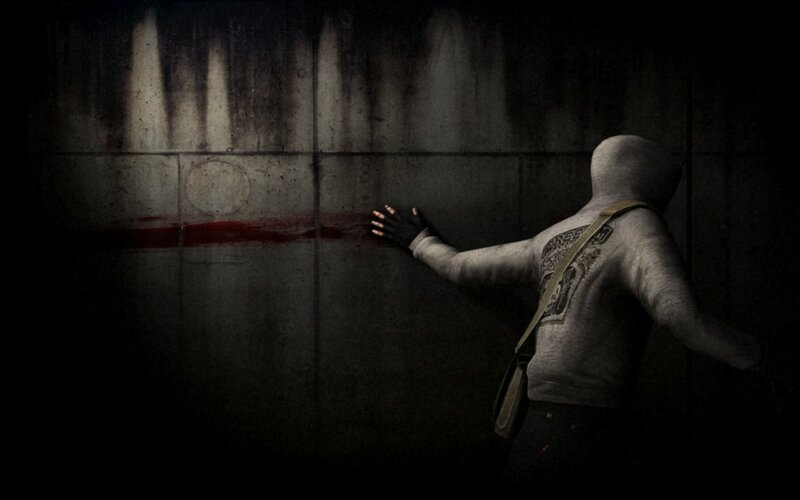 It’s true there are a number of jump-scares scattered throughout the game, yet a majority are in the beginning. These instances, although startling at first, are fleeting, and not where the horror resides. The real fear comes from the anticipation of encounters with enemies, whether they jump out at you or not. This feeling of helplessness (felt by you and Simon), coupled with the dimly lit environments and eery soundtrack results in a long-lasting experience of psychological fear throughout the game. As the first encounter with an enemy reveals, you are being constantly watched, stalked, and preyed upon. Simon even pukes and passes out at the end of the first chapter, collapsing under stress. This Horrible Night blurb summed it up best- “Your biggest enemy is the unsettling feeling that follows you from room to room.” Still, one of the scariest parts of the game wasn’t an encounter with a monster, but being ran over by a train (if you’re not quick enough). This sequence felt as if I was running in a dream, despite sprinting with all my effort. When death struck it wasn’t from being bludgeoned or punctured, but by being flattened and smeared on the tracks by an unknown conductor, ironically similar to the unfortunate car accident in the introduction. Team Psykskallar put a lot of thought into the enemies aside from movement and physical appearance though. Being Simon’s inner demons, many (but not all) of these represent his darkest desires, fears, insecurities, and flaws. The most prominent desire of Simon is to finally end his suffering via suicide, a reoccurring theme throughout the game. A few enemies have death animations that features them committing suicide, such as one who stabs itself in the throat in its death throes, or one that fires a gun to its head once it catches up to you (named, you guessed it, “Suiciders”). Another enemy which appears in the forest damages Simon as it falls from the treetops, screaming with a noose around its neck until the rope snaps taught. 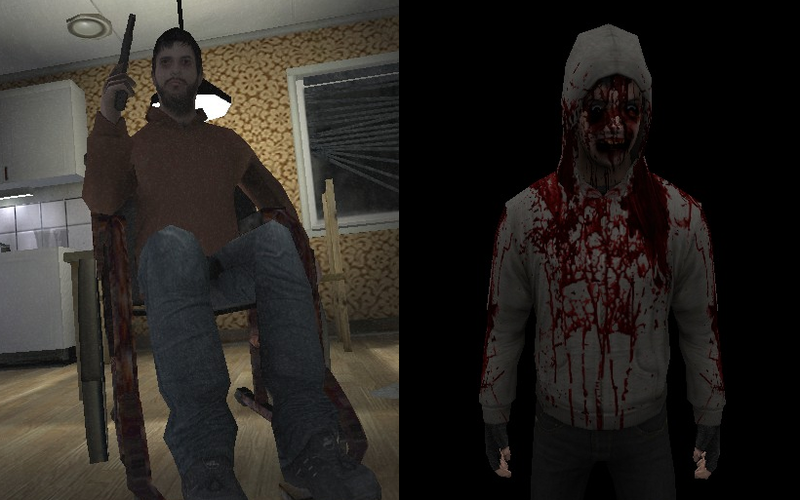 A couple of NPCs have also committed suicide throughout the game, such as one who has overdosed on pills in a bathtub, or the seated corpse who painted the walls with their brains, still purposefully clutching the shotgun. However, the most original and engaging reference to suicide was accomplished as one of the enemies’ ranged attacks where Simon’s body is taken control of, raising his own gun to his jaw, willing to pull the trigger if you don’t react fast enough. Another reoccurring theme revolved around paralysis. Many enemies have limbs bound or paralyzed themselves, an obvious connection to Simon’s misfortune, his source of insecurity, weakness, and ultimately self-hatred. One enemy even features an open book for a head, a subconscious reminder that the disturbing contents of his book have completely consumed him mentally. It all began to click after seeing one of the last messages which doubles as a puzzle. 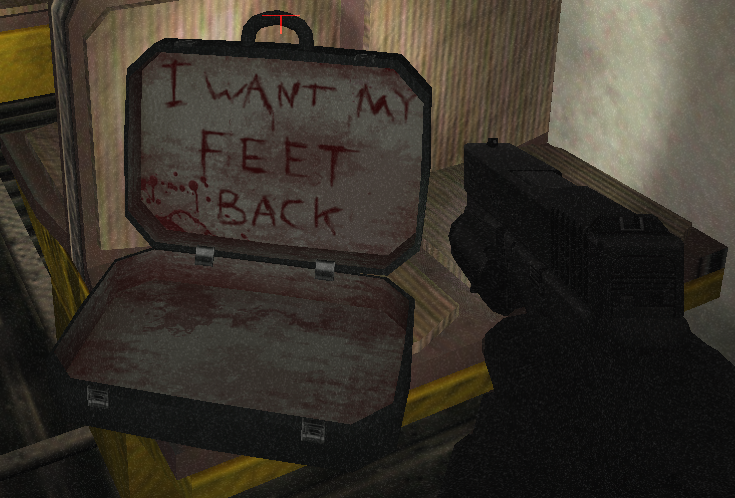 While in the train, an open suitcase reads “I want my feet back,” and the player must retrieve a severed foot from the front of the train and place it in the open suitcase. Sadly, this disembodied entity isn’t alone in wanting to reclaim the use of its feet. Even before the incident on the “Black Day,” Simon’s epithet for the day he lost his legs, he’s always felt alienated. His loneliness (expressed in the game’s introductory text above) is epitomized in the game, traversing a modern city in complete isolation. His new impairment only exacerbates the alienation, separating himself from his former physical capacities. Simon even feels disconnected from the people that care for him, murdering his friend, doctor, and mother. Inevitably, he feels alienated from himself, losing his identity as the psychosis deepens. Over the course of the game, Simon helplessly deteriorates. He is constantly haunted by the event on the Black Day, visiting the dreaded street corner regularly, eaten away by regret. Once his psychosis forms and gradually develops, it eats away at his former identity (known as Sick Simon), and creates an evil, self-destructive identity (known as Book Simon). Although the evil Book Simon is technically a hallucination, he represents the pessimistic, darker aspects of Simon that have emerged since the accident. The constant morphine injections eat away at Simon’s body, the drugs dull the physical pain but can’t address his deteriorating mental state. Various unexplainable, unsettling “nightmare” sequences are scattered throughout the game as he loses grip on reality. Simon must traverse through these areas, such as a blood-soaked “never-ending” staircase, hallways filled with hundreds of clawing hands, gravity-defying platforms surrounded by tortured bodies in cages, etc. These scenes not only add to the terror of Simon’s situation, but also intensify the mysteriousness of his circumstances. As the game progresses, the nightmare sequences become more frequent and morbid. Soon, the psychosis becomes persistent, and the two separate identities erode Simon’s vulnerable psyche. The real, sick Simon (left) and the psychotic, evil hallucination Book Simon (right). 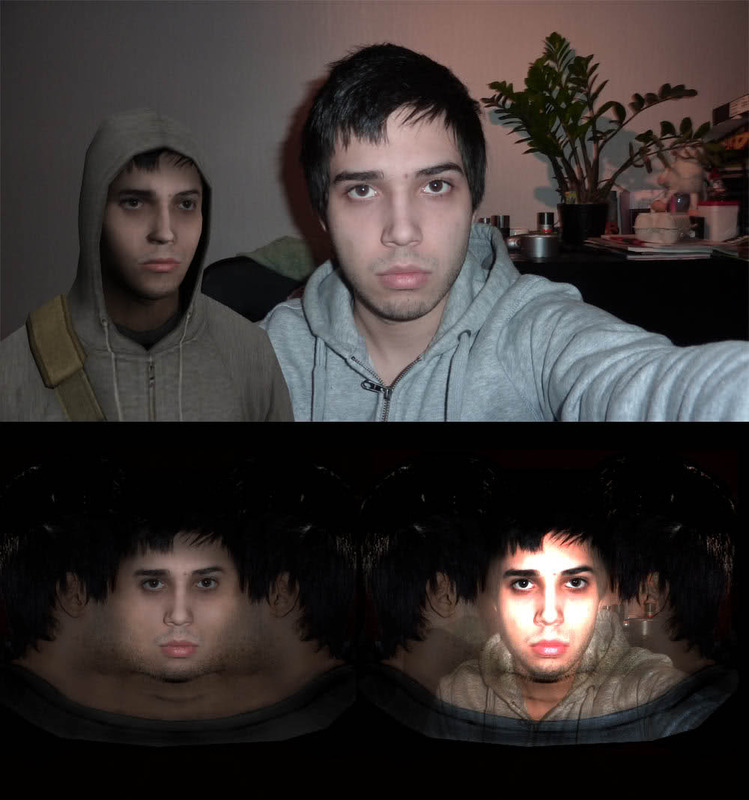 Throughout the game a sharp contrast exists between Simon’s perception of reality and the truth, produced by his schizophrenia. His self image is completely inaccurate. Whereas he sees himself as clean cut, able to walk and run, and sane he is actually experiencing a mental/emotional breakdown, paralyzed, and unkempt in his wheelchair. In the game, Doctor Purnell is seen as a devious aggressor, one who intends to harm Simon and keep him unaware of the truth. In reality the doctor is one of the few people that truly care about Simon, and only works towards his benefit. The game teaches us that everyone is our enemy, everyone is out to kill us, when in reality, Simon is the single, true enemy. The nightmare sequences are some of the most unreal, impossible situations, and they are presented as being imaginary or hallucinated, when actually, the entire game experience is a delusion. By the end of the game, Simon has defeated countless enemies, escaped improbable situations with the odds stacked against him- we are competent and powerful enough to conquer these demons. Unfortunately, the opposite is true: Simon is decaying and eventually succumbs (in most endings) to his depression, killing himself. Simon is definitely a disturbed individual, but his personality and reactions are authentic, allowing the player to empathize easily. Perhaps this is because he was literally modeled after developer Andreas “ruMpel” Rönnberg, and contains elements from everyone on the team. Thankfully, Simon isn’t tormented the entirety of the game. 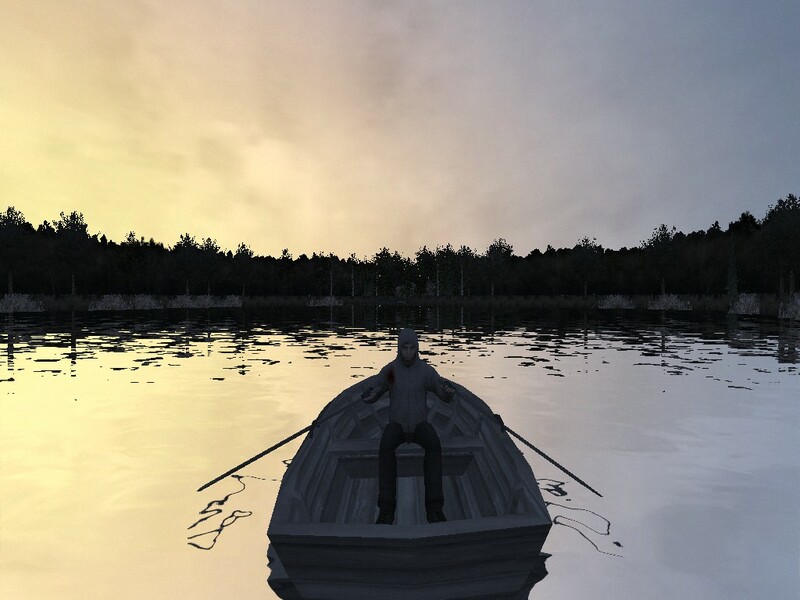 He’s granted a short moment of serenity as he crosses a lake on a small rowboat where he remains unthreatened as he unknowingly prepares for the game’s conclusion. After all the previous tortures both Simon and the player have suffered in the night, this brief lake oasis sequence during dawn is jarringly serene. The solitude of dawn, a new opportunity. The peaceful calm before the storm is met with a unique, unpredictable final boss fight at the end of the game. Depending on various choices you make, you will either face Sick Simon or Book Simon, one of the halves of our schizophrenic protagonist. Defeating Sick Simon results in real Simon committing suicide, and the epilogue text is one of three suicide notes. Strangling a helpless version of myself was surprisingly hard to do, and the suicide notes are extremely violent and depressing. The only “good” ending is attained when you defeat Book Simon, finally eliminating the self-destructive identity. Although it’s not particularly happy, it’s comparatively better than the three somber endings feature our protagonist murder his loved ones before himself. This ending also features Simon finishing his book, finally able to come to terms with his life, ending the hellish psychosis. No matter what ending you get, Simon must fight an aspect of himself. Even though Simon’s story is over at the conclusion, the game still has much more to offer. 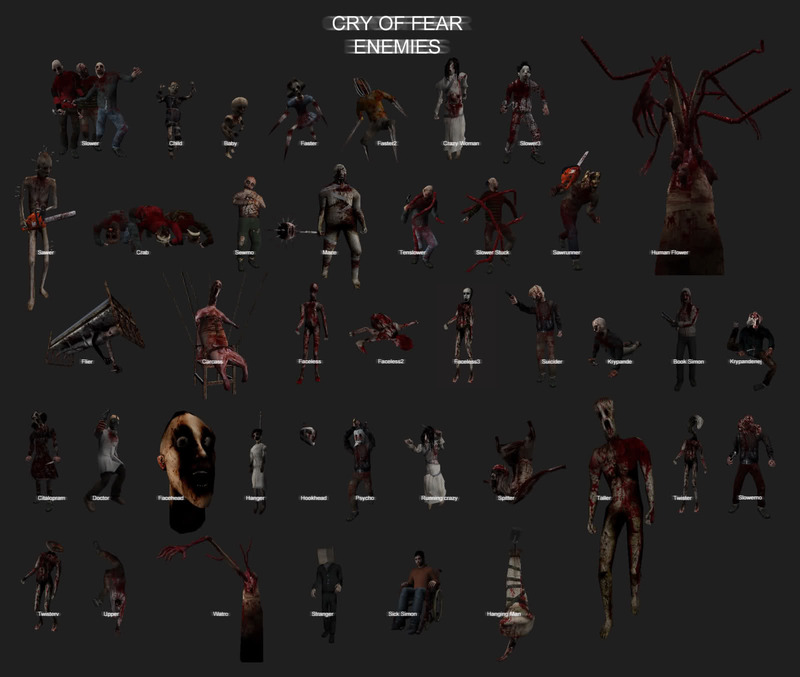 Cry of Fear boasts plenty of additional content that adds to the replay value: multiple difficulties, multiple endings, story related co-op campaigns, custom fan-made campaigns, unlockables (skins, secret weapons, and the Doctor Mode), and developer commentary. Although it’s not a game where you actively score points, there’s also a final score you are given at the end of the game which incentivizes more accurate and faster playthroughs. The co-op campaign and Doctor’s Mode enrich the original experience by expanding upon the narrative while still providing a different gameplay experience (the former being up to four person co-op while the latter is a timed-survivor mode). Team Psykskallar deserves much respect and praise for the depth of interpretation Cry of Fear offers. Each element of the game works synergistically, providing a polished gameplay experience portraying Simon’s inner struggle. And that’s what I loved about the game most: it wasn’t some grandiose, pubescent power fantasy about saving humanity- just a young man confronting his personal problems, saving himself from himself. All too often this game is dismissed as a survival-horror game, when it’s really a human game, commenting on the complex, overwhelming emotional exhaustion and psychological pain we endure after traumatic experiences. Unfortunately, these tragic parts of our lives are often completely out of our control, yet how we respond will always remain in our power, defining who we are. Hey, there. I know, it’s been almost a year since you wrote this review/analysis, but… I just wanted to tell you: “Good job!” Your review captured the essence of the game perfectly, and it made me realise once more why exactly Cry of Fear is such a great game. Previous Post Seasons of Giving: Dialog Wheel’s Gaming Giftaway!